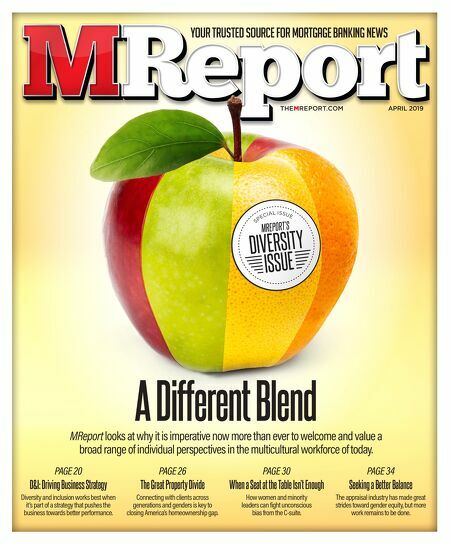 YOUR TRUSTED SOURCE FOR MORTGAGE BANKING NEWS THEMREPORT.COM APRIL 2019 A Different Blend MReport looks at why it is imperative now more than ever to welcome and value a broad range of individual perspectives in the multicultural workforce of today. PAGE 20 D&I: Driving Business Strategy Diversity and inclusion works best when it's part of a strategy that pushes the business towards better performance. PAGE 26 The Great Property Divide Connecting with clients across generations and genders is key to closing America's homeownership gap. PAGE 30 When a Seat at the Table Isn't Enough How women and minority leaders can fight unconscious bias from the C-suite. PAGE 34 Seeking a Better Balance The appraisal industry has made great strides toward gender equity, but more work remains to be done.